Jetta L. Allison, age 85, of Spencer, passed away peacefully at 5:58 A.M. on Monday, November 5, 2018, at Monroe Hospital in Bloomington. She was born in Robinson, Illinois on November 24, 1932, the daughter of Paul O. & Louise I. (Coler) York. Jetta graduated from Robinson High School in Illinois as Valedictorian of the class of 1950. She worked in earlier years as a secretary for Marathon Oil Company Refinery offices. She married George L. Allison on March 7, 1954 and moved to Laurel, MD while he was stationed in the U.S. Army. She attended Eastern Illinois University and graduated from Indiana University with a degree in elementary education. Jetta was an active member of the Spencer United Methodist Church where she taught Sunday school, served as secretary to pastor, church treasurer, and financial secretary. She was also a member of the Ladies Golf League, Ladies Birthday Club, Owen County Public Library Board, and Tri-Kappa, all of Spencer. Throughout her life, she lived in Robinson, IL, Terre Haute, Bloomington, and moved to Spencer permanently in 1963. 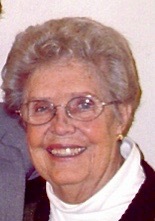 She is survived by her husband of 64 years, two daughters, Julie (Michael) Donham of Bloomington and Jennifer Dunning of Spencer, her grandchildren, Amber (Kenny-Ray) Augustus of Indianapolis, Allison, Andrew, and Alexandra Donham, her great-grandson, Xavier, and her brother, Lyle York of Peoria, Illinois. She was preceded in death by her parents, her granddaughter, Ashley Diane Dunning on August 17, 2018, and two infant brothers. Funeral service will be held at West & Parrish & Pedigo Funeral Home in Spencer at 11:00 A.M. on Friday, November 9, 2018, with Dr. Diane Wells and Rev. Drew Baker officiating. Burial will follow at Chambersville Cemetery in Spencer. Visitation will be held at the funeral home on Thursday from 4-8 P.M., and on Friday from 10 A.M. until the time of service. In lieu of flowers, memorials may be made to the Owen County Community Foundation in memory of Jetta Allison. Online condolences may be shared with the family at www.westparrishpedigo.com.